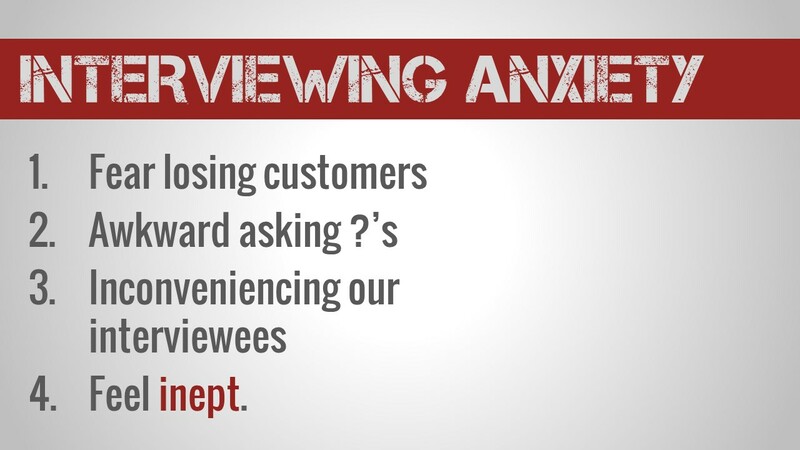 If you’re wondering how many customer interviews you should conduct, you’re not alone. This is a really common question, and there are a few common answers. First let’s discuss those common answers, and what they’re lacking, so you can understand the benefits of a different approach. Unfortunately, this approach isn’t very useful because, whenever you talk with anyone, you’ll be learning something new. So the question ends up being, “When have you learned enough that you can move on to the next step?” which is just as difficult a question to answer as “How many people should I interview?” so you’re no better off than you were before. I’m really not a fan of this approach. If your goal is to interview until you have a certain number of conversations, you’ll end up focusing more on the quantity of interviews, and less on the quality – which will end up being a huge waste of time. Let’s talk about a different approach, one that I find much more helpful. 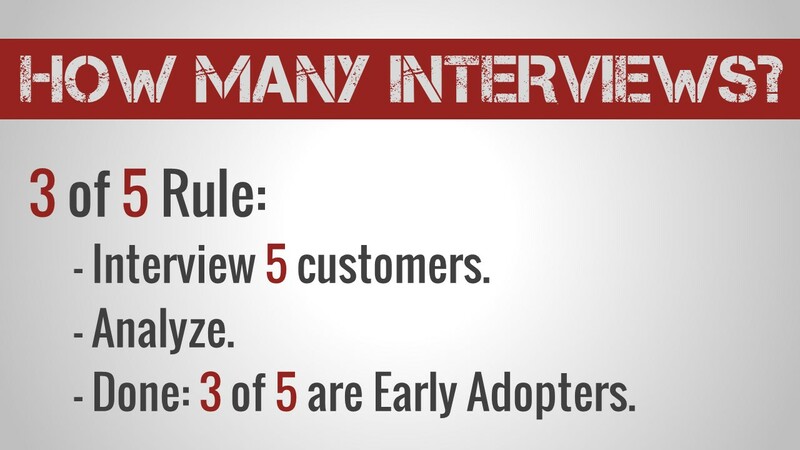 At least 3 of the last 5 people you’ve interviewed, are Early Adopters. By the way, if you haven’t read my articles on Early Adopters yet, you need to stop reading this, and read them now. Not only will they help you throughout your startup journey, it will be hard to make the most of the rest of this article without that context. If 3 of the last 5 people you talk to are actively seeking a solution to the problem you’re trying to solve, you’ve found your Early Adopters. Once you’ve found your Early Adopters, you’re ready to move on to your Offer Testing. 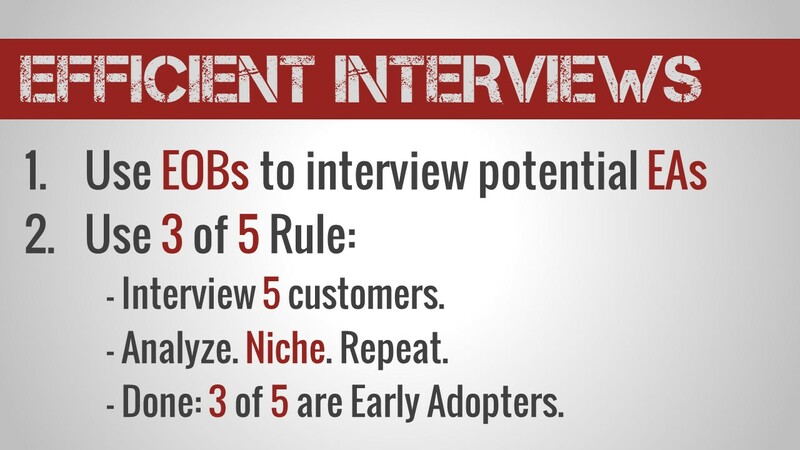 Why Batches of 5 Interviews? 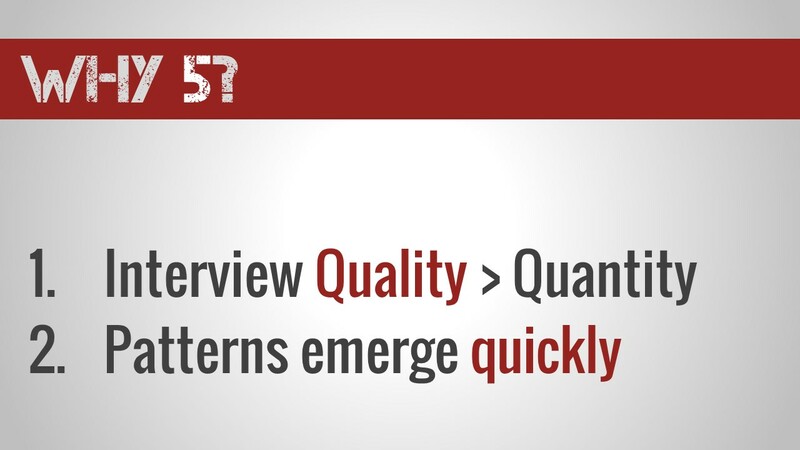 Because interview quality is exponentially more important than interview quantity. 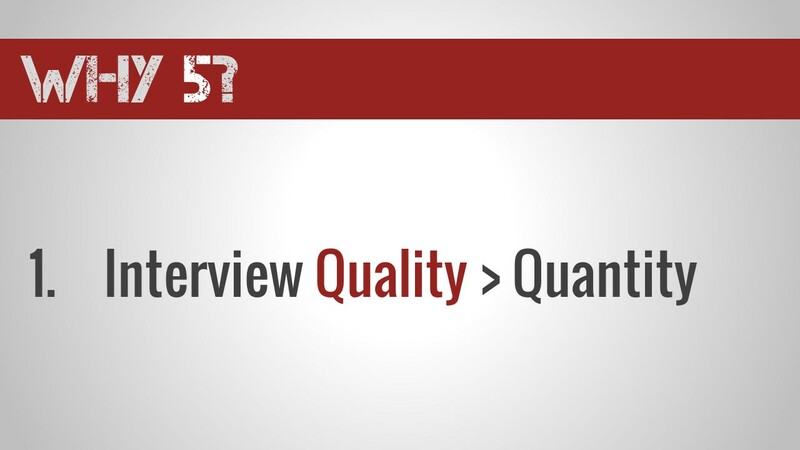 The whole point of doing these interviews is to do qualitative research. This is your chance to do a deep dive with individual customers. Where they’re looking for solutions. You’ll worry about doing quantitative research later on in Offer Testing, but for right now, you need to focus doing a small number of high-quality, in-depth interviews, with the right people. If you try to interview more than five people at a time, you may accidentally force yourself to widen the scope of people you’re willing to talk to. 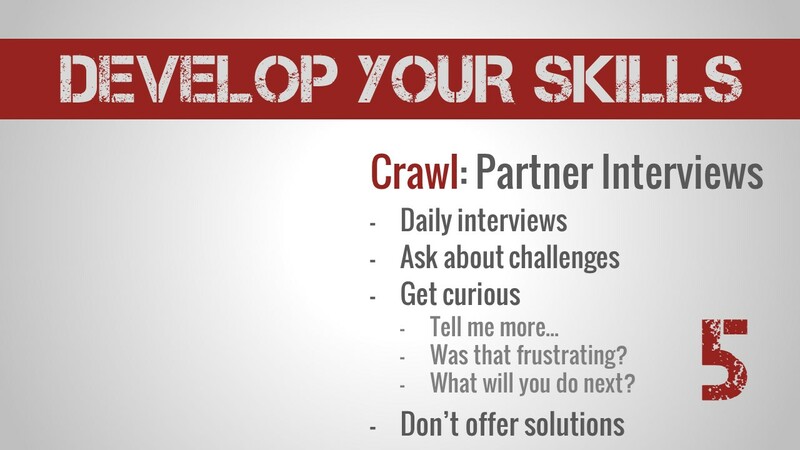 Before you know it, you’re interviewing people across different customer segments, and ultimately you’ll be unable to find a pattern of the problems you’re trying to solve. Your Early Adopters will describe the same problems in the same way. Once 60% (3 out of 5) of the people you’re talking to describe the same problems in the same way, you’ve found your Early Adopters! Once you’ve confirmed you’ve found your Early Adopters on this small scale, you’ll be ready to do your Offer Testing, where you validate you can find your Early Adopters on a large scale – large enough to give you confidence you can achieve Product-Market Fit. If you don’t know what EOBs are, or haven’t memorized the definition of Early Adopters yet, read this article and this one. b. Analyze the results. Niche. And Repeat if necessary. You’re interviewing customers but no pattern is emerging. You’re having trouble even getting 5 interviews. You’re not sure if you’re asking the right questions. The FOCUS Framework is used by thousands of founders to help them take action finding Product-Market Fit. Check it out and see if it can help you. 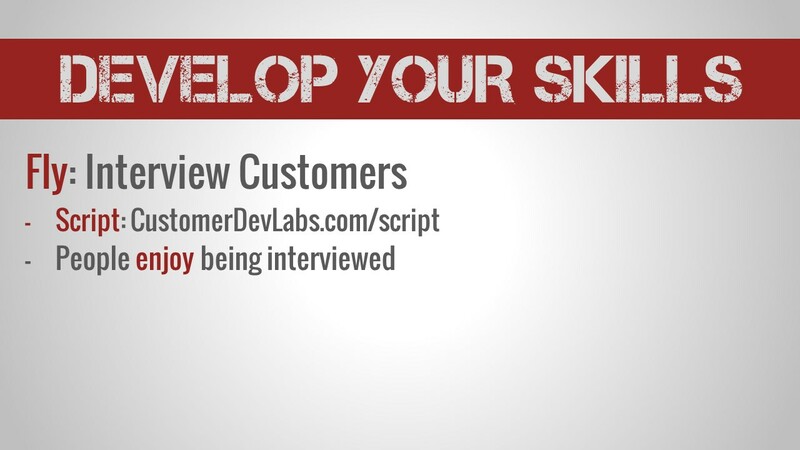 Now you know exactly how many customers to interview, and when you’re ready for Offer Testing. Go out and talk to your customers! On the path to your Product Market Fit, not all potential customers are created equal—at least, not at the beginning. The first group of people you need to win over are your Early Adopters. Many think “Early Adopters” are people who sleep outside of the Apple store before a big launch. People who always have the latest new gadget is one definition of Early Adopter, but that’s not who we’re referring to in the context of entrepreneurship. 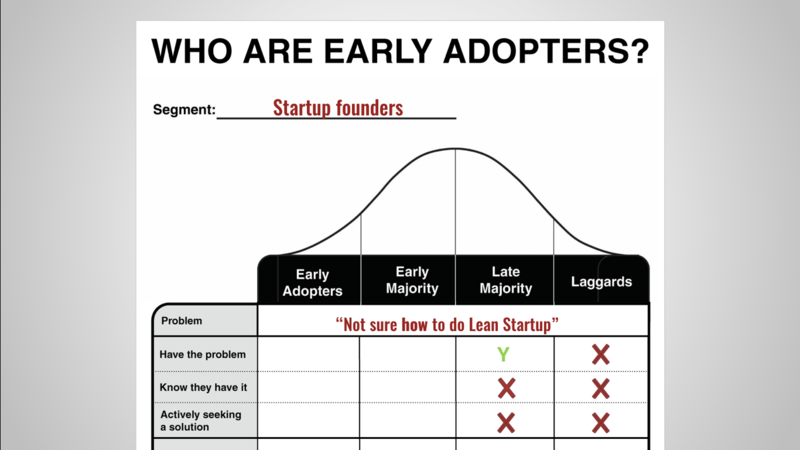 In entrepreneurship, the Early Adopters are the first group of people that buy any new product/service (tech or otherwise). The Early Adopters are followed by the Early Majority, Late Majority, and the Laggards. A simplified version of the Diffusion of Innovations Curve. The Diffusion of Innovations curve represents the growth of a product over time in terms of customers. Many of you will achieve Product Market Fit once your Early Majority is using your product. You have to get your Early Adopters. Why Do Early Adopters Matter So Much? Without Early Adopters, there’s no one to tell your Early Majority about your product. If you don’t get your Early Majority, no one will convince your Late Majority to use your product, and of course, you’ll never find your Laggards. If you can’t find Early Adopters for your product, you won’t find Product Market Fit. To understand who your Early Adopters are, you need to remember something I talk about all the time: customers don’t buy products. Customers buy solutions to problems. So, the way to tell if someone is an Early Adopter is to assess their relationship to the problem you want to solve. 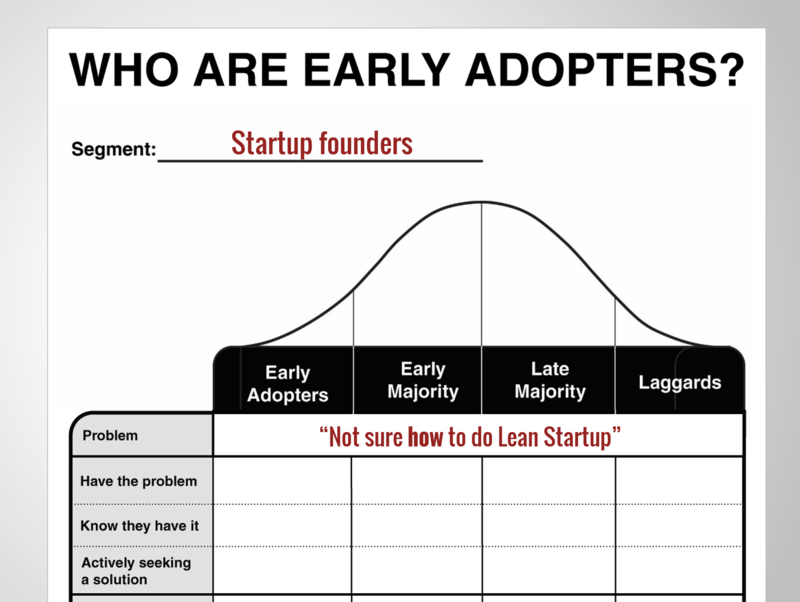 I’ll break down each of the groups on the Diffusion of Innovations Curve using this example, so you can see what makes Early Adopters so unique. Laggards are people who fall into your customer segment, but they will be the very last group of people to use your product or service. Why? Because laggards are people in your segment who literally don’t have the problem you’re trying to solve. Startup founders who have no methodology at all (e.g. the “build it and they will come” founders). You can see, none of the groups listed above would ever say the words, “I’m not sure how to do Lean Startup”, so they’re going to be the last group of people we build a solution for. Since they don’t have the problem, you can infer that they don’t know they have a problem, and therefore, aren’t actively seeking a solution to it. So, they get X’s down the entire column in the chart above. They don’t know they have the problem. For instance, a Late Majority startup founder might call herself “lean” because she has/spends very little money (an incorrect definition of Lean). Alternatively, someone who thinks an ”MVP” is the same thing as a beta version of the product could also be considered a member our Late Majority. We know these people will have problems applying Lean Startup principles, because they don’t understand them. If you have to educate your customers about their problems, you’re talking to a member of the Late Majority. Members of the Late Majority are extremely difficult to sell to because you have to spend a lot of time just to get their attention…only so you can convince them they have a problem! No one likes to be told they have a problem they don’t see in themselves, so it’s a huge waste of time to try and convince your customers they have a problem that you see and they don’t. They aren’t actively looking for solutions to it. The problem isn’t painful enough yet (e.g. a founder who just started reading Lean Startup but hasn’t started to implement it). They’ve looked for solutions before but didn’t find anything suitable, so they stopped looking. 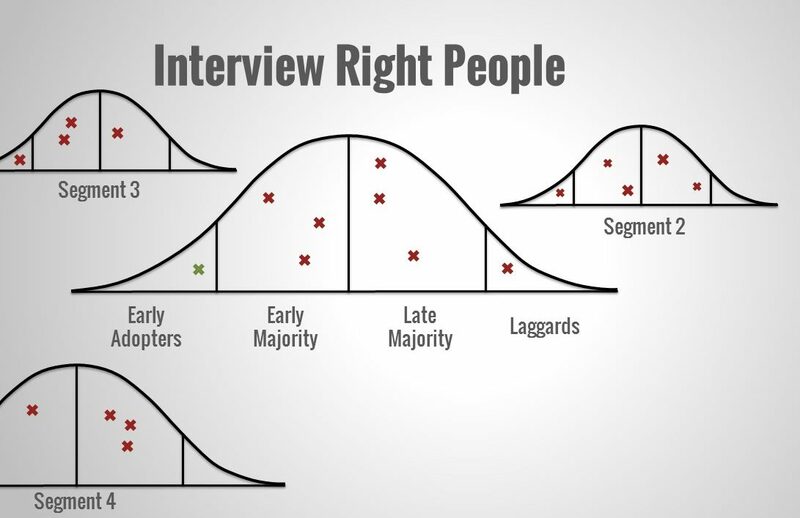 The Early Majority is often big enough to help you achieve Product Market Fit, but they won’t come onboard until you first have Early Adopters. They are actively seeking solutions to it. These are the people you want to target first. They’re already looking for a solution, so they are much more likely to take a risk trying out a new product — a product they’ve never heard of, from a company they’ve never heard of — like yours! In fact, Early Adopters are so excited about solving their problem, they’ll often pre-pay you to build a solution for them. Then, they’ll happily spread the message to other people who have the same problem (i.e your Early Majority). Think of any successful Kickstarter campaign – they’re supported by hoards of Early Adopters, pre-paying to solve a “problem” (whether physical, emotional, or intellectual), who then share that solution with their friends via Facebook and Twitter. By the way, the same principles apply in B2B scenarios as well (just with less publicly visiblefanfare). This, my friends, is how you achieve Product Market Fit. 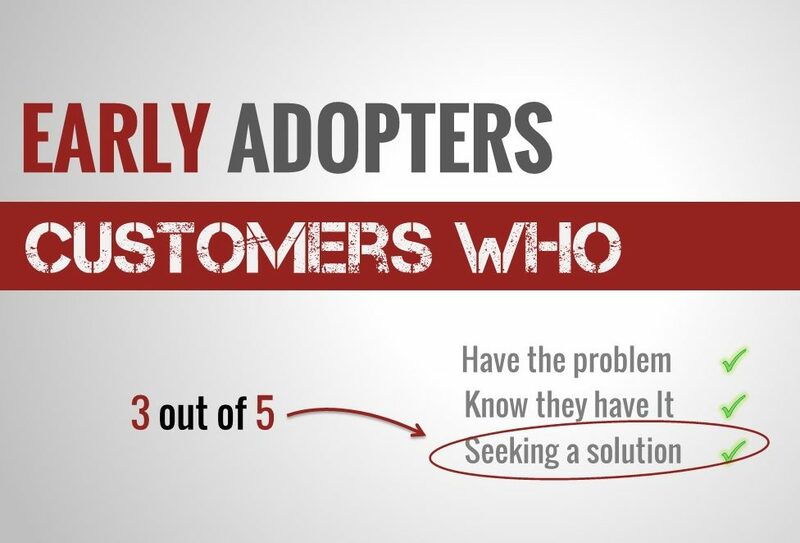 Find your Early Adopters who are already seeking a solution to a problem. Then, they’ll tell your Early Majority about it for you. Now that you know what to look for in an Early Adopter, you can identity them for your startup. Start by writing down the actions an Early Adopter might make when looking for a solution to their problem. For instance, if you found this blog by searching for articles on a specific topic, you’re an Early Adopter in our startup founder example because you’re actively seeking a solution for applying Lean Startup principles. However, if a friend shared this blog with you and you thought, “Interesting, maybe I’ll check it out,” you might be in the Early Majority; you know you have a problem, but maybe you weren’t actively seeking a solution to it. You need to find the people who are actively seeking a solution to the problem you want to solve. These will be your first customers. 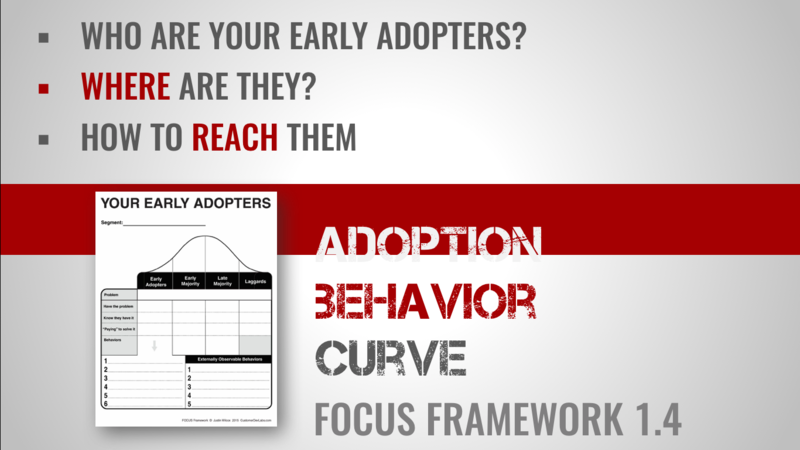 If you want detailed guidance finding your Early Adopters, take a look at the Adoption Behavior Curve worksheet. 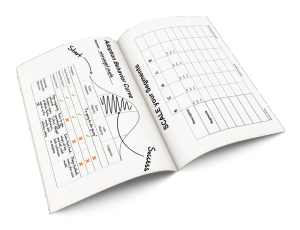 It’s the 4th exercise in the first FOCUS Framework workbook. How to reach out to them. Are actively seeking a solution for it. For Part 2 of this series on Early Adopters, check out Early Adopters Part 2: Who you should Interview. Good ideas matter. It’s hard to start a company if you don’t have an idea. But… having one business idea is never enough. Give up on your idea (and your identity as a founder). Ignore what your customers are telling you and press onward. Both of these choices are terrible. I don’t want you to give up, and I don’t want you to ignore your customers. You need a third option, and I want to recommend one: backup business ideas. If you have a set of backup business ideas, you can listen to your customers with open ears and an open mind. So what if the world isn’t ready for first idea yet, as long as you have other ideas you’re excited about pivoting to. Having backup ideas helps you validate your primary idea faster. Why are Good Ideas Hard to Come By? To come up with good ideas, we have to first understand why they’re so hard to come by. People who are bad at coming up with business ideas. People who are bad at coming up with good business ideas. People who don’t identify as “creative thinkers” don’t believe they can come up with good business ideas. While people who do identify as creative (myself included) come up with ideas on a daily basis. The problem is, no matter how excited we get about our ideas…they’re almost always awful. No matter who you think you are—creative or non-creative—we’re all really bad at coming up with good business ideas. Here’s why. Imagine someone coming up with a good business idea. What do you think that process looks like? You’re probably thinking of someone, deep in thought, getting struck by some form of inspiration. At that moment, they’ve come up with some brilliant new app, service, or innovative widget. Unfortunately for that imaginary founder, their great new idea is doomed to fail – their customers, more than likely, are going to reject them. Why? We can’t think our way to an interesting product. Since we know customers buy solutions to problems, we have to first start with the problem! The secret to coming up with good business ideas isn’t to focus on the “idea” at all…it’s to focus on the problems we want to solve. The ultimate secret to coming up with good ideas is to focus on the problem not the product. To figure out which problems you are uniquely suited to go and solve, let’s use an exercise called Problem Storming. 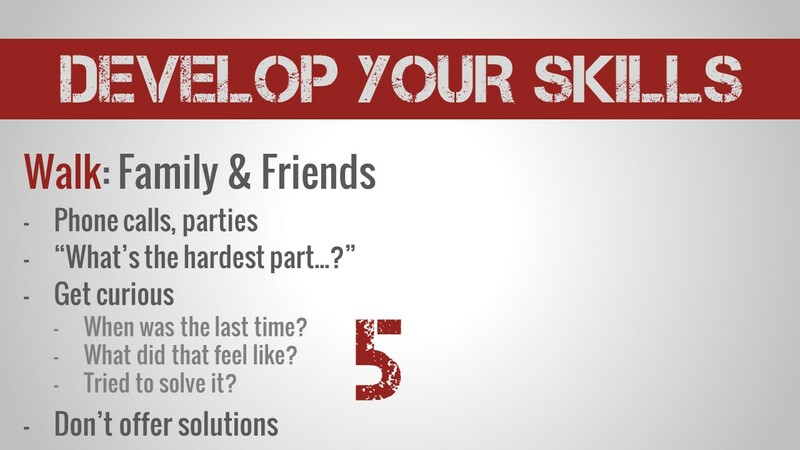 When I do this exercise in workshops with founders, we come up with at least 5 quality business problems to go solve. Write down 2 groups of people you identify with, e.g. full-time working mothers, recent college graduates, vegetarians, etc..
Now write down 2 different groups of people you’re passionate about helping, e.g. under-resourced children, skateboarders, meditators, etc.. You should now have at least 4 different groups of people written down. Write 2 potential problems that each group might be trying to solve right now. For instance, skateboarders might have problems transporting their skateboard on public transit, working mothers may feel guilty that they don’t spend as much time helping their kids with homework as stay-at-home moms, etc. you’re passionate about solving that problem for others. This is the beginning of the Problem Storming process. 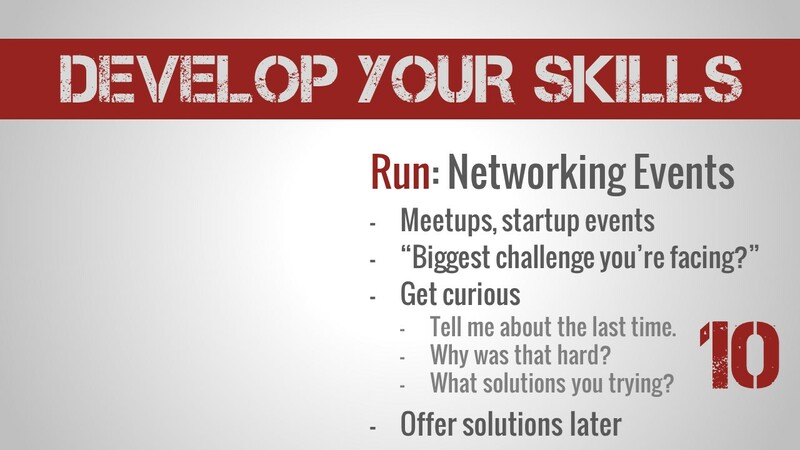 After 8 ideas, you’ll have at least 1— probably 2—promising problems to go investigate. That’s how you know you’re on track to a good idea. Keep Problem Storming until you have at least 3 problems you’re excited to solve. Once you have those, it’s time to prioritize those problems and start validating that people are trying to solve them! 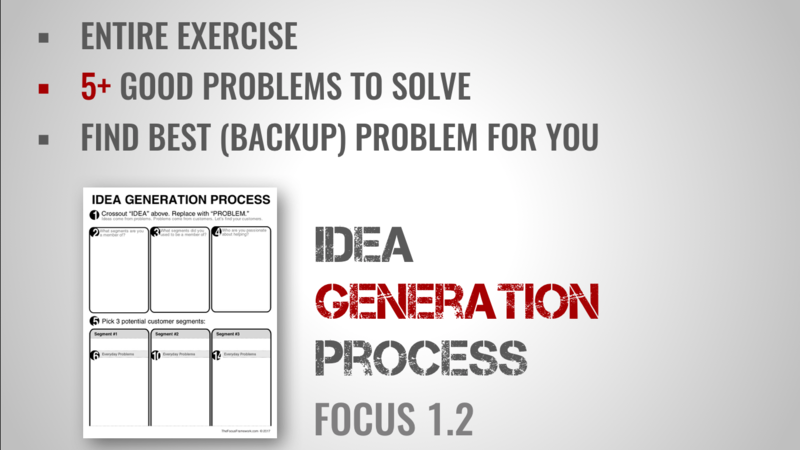 The Idea Generation Process is the second exercise in the FOCUS Framework workbook series. FOCUS breaks down the overwhelming process of finding Product-Market Fit, into actionable steps. If you want help applying the Lean Startup or Business Model Validation processes, take a look at the FOCUS Framework.